to get the whole album including coverart. for those who don’t like 128Khz mp3: you can purchase the CD-R @ the Satori Hype Mailorder. „Undead or alive“ is a release that‘s coming too late and won‘t fit at all in the overall musical context of Satori Hype Records. It‘s vintage 80ties music from a time when nobody made self titled releases but a few cassettes. Folk‘n‘roll over cheap beatboxes, Robby-Krieger-like-guitars, thumb-sketched songs with rockstar attitudes. Recorded in a bedroom. It is subtitled with „Music for myself“. 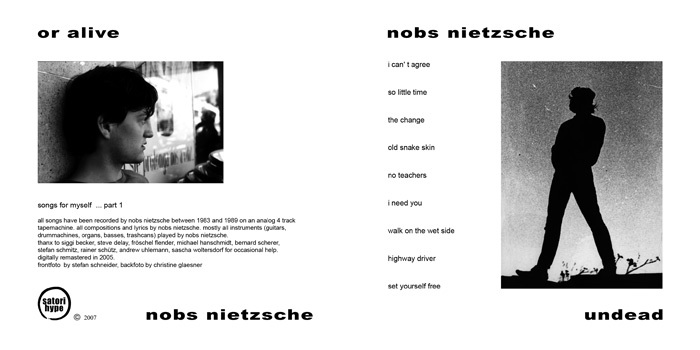 nobs nietzsche has been the younger appearance of the artist we know today as fatagaga.